Julie Carpenter is a Wiccan; a Wiccan who at one time had a relationship with Jonathon Sharkey, a self-proclaimed Satanist and Vampire who at one time decided to run for Governor of Minnesota. 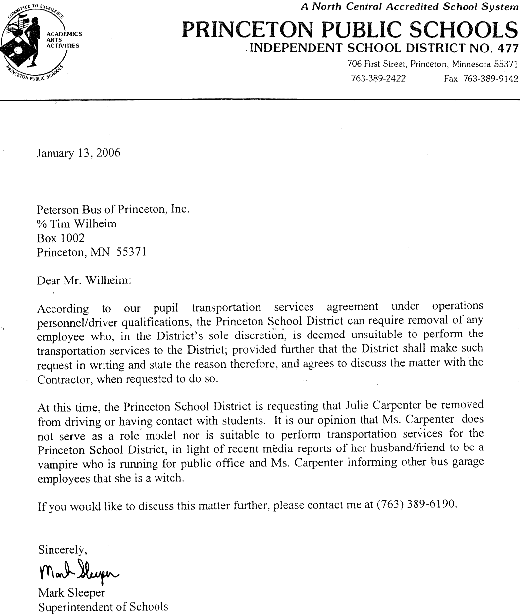 As a result of the predictable media attention surrounding said campaign and subsequent unveiling of her own beliefs, Julie's then employer - Peterson Bus of Princeton - received the following letter from the Princeton Schools Superintendent, in which he requests the termination of her contract as a bus driver; a post she had, until this point, held for four years without blemish. A bizarre situation, elevated to comical heights by the final sentence in the second paragraph of this letter. Related Metafilter thread here, along with an appearance by Julie herself. Peterson Bus of Princeton, Inc. According to our pupil transportation services agreement under operations personnel/driver qualifications, the Princeton School District can require removal of any employee who, in the District's sole discretion, is deemed unsuitable to perform the transportation services to the District; provided further that the District shall make such request in writing and state the reason therefore, and agrees to discuss the matter with the Contractor, when requested to do so. At this time, the Princeton School District is requesting that Julie Carpenter be removed from driving or having contact with students. It is our opinion that Ms. Carpenter does not serve as a role model nor is suitable to perform transportation services for the Princeton School District, in light of recent media reports of her husband/friend to be a vampire who is running for public office and Ms. Carpenter informing other bus garage employees that she is a witch. If you would like to discuss this matter further, please contact me at (763) 389-6190.